The No. 5 Stanford men’s golf team saw its spring season get off to a solid start last weekend with a sixth-place finish in the Amer Ari Invitational in Waikoloa, Hawaii. 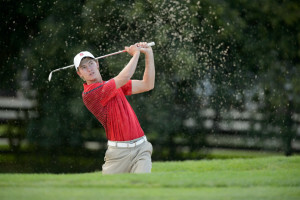 Second-ranked individual junior Maverick McNealy led the Cardinal against a deep field of competitors, which included three teams ranked in the current top 10 and seven in the top 30. McNealy was one of just two golfers to hit at least four strokes under par in every round, showing his elite consistency in the process. Stanford came out swinging on the first day, tying for the lead with eventual winner No. 7 USC at 10-under-par with strong play at every position. The Trojans improved on the second day while Stanford seemed to struggle by comparison, with McNealy and sophomore Bradley Knox the only players to match or improve upon their scores from the opening round and the team overall falling back into sixth place. The third round proceeded much as the second had, with the Cardinal matching the collective 4-under performance that they had earned on day two. These results proved sufficient to keep the team from losing any more ground, but they weren’t enough for it to move up in the highly competitive field. McNealy finished the tournament in third place overall, getting edged by Oregon’s Aaron Wise after he posted a tournament-best 64 on the final day and USC’s Rico Hoey after he managed an eagle on the 18th hole. Senior David Boote followed close behind McNealy with a -5 performance that put him in a seven-way tie for 13th place. Junior Viraat Badhwar, freshman Brandon Wu and Knox all finished over par to round out the team’s performance, but all managed to demonstrate the team’s considerable depth by squeezing into the top 75 of the 115-person tournament. The Cardinal did get a pleasant surprise in a strong showing by freshman Isaiah Salinda, who played in the tournament as an individual since teams can only count the scores of five players toward their totals. Salinda hit an impressive 17 birdies over the course of the three-day event, launching him into a tie for 30th place with a score of -2 overall. With their trip to Hawaii complete, the Cardinal will look forward to continuing their season in La Quinta, California with an appearance at the Prestige at PGA West. Stanford finished second in this event last season after impressive final-round performances from McNealy and Badhwar helped the team to a -20 score on the day. These clutch performances rocketed Stanford up five places in the standings and helped to establish McNealy as one of the preeminent collegiate golfers in the country. The spotlight should be on McNealy again in this year’s iteration of the tournament. The junior was recently named to the Ben Hogan Award watch list for the best collegiate golfer in the country — an honor that examines both collegiate and amateur performances — and McNealy will hope to solidify his case with a series of strong showings this spring. “If you don’t know where [McNealy] is, he’s probably at [the Siebel Varsity Training Center] practicing,” teammate Jeffrey Swegle recently joked on the team’s blog. The Cardinal will head down to Southern California for the Prestige on Monday, Feb. 15.